Antonella Cardone is the Director of the European Cancer Patient Coalition. She has over twenty years of international activity in health, social and employment sectors. Prior to ECPC, Antonella was the Executive Director of the Fit for Work Global Alliance, a multi-stakeholder coalition championing change in health and work policy. She also worked with the European Multiple Sclerosis Platform, a patient organisation, on the "Ready for Work" project. She was previously Director of the Global Smokefree Partnership of the American Cancer Society, leading a movement of over 100 members among civil society, universities, and ministries of health to coordinate the development of smoke-free laws in 40 countries. Antonella has managed over 40 large EU co-funded projects across all EU member states. She holds a Master’s in Business Administration. She is mother tongue Italian, with a good knowledge of French and Spanish and is fluent in English. Isabelle is ECPC's Head of Health & Research Programmes and is the appointed executive body for our research activities from industry to EU funded projects participating in several European Union's Research and Innovation framework programmes in addition to working on 3 principal EU Policy files: the European Cross Border Health Directive, the General Data Protection Regulation, and Health Technology Assessment. She is a registered Pharmacist (RPh) and certified Public Health Professional (CPH) holding a post-master degree in European Studies specialising in EU Policy & Project Management. Isabelle is a USAID Training Future Leaders Scholarship recipient, a Golden Key International Honour Society member, and a EUPATI Expert Patient in R&D who has dedicated over 10 years of her life to patients. She has previously worked with the United Nations (UN) and the European Civil Protection and Humanitarian Aid Operations (ECHO), among others around the globe. Isabelle is an active member of the General Assembly of the Worldwide Innovative Networking in personalized cancer medicine (WIN) Consortium, the Belgian Health Care Knowledge Centre (KCE) Trials Panel, the European Society of Medical Oncology (ESMO), the European Commission's Health Technology Assessment (HTA) Stakeholder Pool, Health Technology Assessment International (HTAi), the BBMRI-ERIC Stakeholder Forum, and the Working Party on Nutrition and Health, and is also an elected representative of the European Patient Advocacy Group (ePAG) for the European Reference Network (ERN) on rare adult solid tumours & the ERN Patient Board. Isabelle is Romanian and identifies as a citizen of the world. She speaks fluent English, Romanian and Arabic, and has a good knowledge of French and basic understanding of Spanish and Italian. 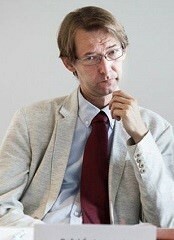 Alex is the Head of EU Affairs at the European Cancer Patient Coalition. In his role, Alex leads on ECPC advocacy activities and policy initiatives. He does so by drawing on his comprehensive knowledge of the EU health policy landscape and his experience of having worked on several award winning public affairs campaigns, with a strong focus on policymaker and Member State stakeholder engagement. He has supported a number of private and non-governmental organisations in successful advocacy efforts at the EU level on a range of disease areas and issue-specific public health challenges. Alex owes his inspiration for bettering public health in Europe to the Commissioner Vytenis Andriukaitis. Next to gaining working experience in the Cabinet of the Commissioner, he also developed an in-depth understanding of interinstitutional relations and EU policymaking and manifested his passion for healthcare. He has also worked in public relations and public affairs agencies in London and China before moving to Brussels. He holds a Bachelor's degree in Public Relations from the University of Westminster, London and a Master's degree in International Communication from the Communication University of China, Beijing. Originally from Vilnius, Lithuania, Alex speaks native Lithuanian, fluent English and Russian, and has a basic understanding of French. With more than ten years of experience in the field of communication and project management (especially in the field of public policy contracts), Jiska has a large amount of experience in managing and coordinating budgets, contracts, people and events. As a Dutch national, she speaks Dutch and English fluently and has a good knowledge of German, French as well as some basic knowledge of Spanish. Clémence Morinière is ECPC’s Partnerships and Communication Manager. For more than ten years she has been working in communications applied to EU affairs and social fields (health, inclusion, poverty, education). She has been involved in projects with European institutions, civil society organisations and citizens with the aim of improving their mutual understanding. Her professional experience includes communication strategies and off-line/online campaigns aimed at raising visibility and awareness, conveying messages to convince influencers, decision-makers, donors, the media and the general public to commit, to donate or to change their mind-set. Her ambition is to create strong messages and forge creative concepts that will catch one’s attention and have a real impact. Today she aims at empowering ECPC Members, ensuring cooperation at EU level, raising awareness and promoting effective campaigns intending for a good life for all based on health, security, equality and education. She holds a master’s in Communications and European Affairs and a master’s degree in Information and Communication Trades. She has previously worked with Médecins du Monde and in EU communication consultancies. She speaks French, English and Spanish. Max Schravendeel is the Health & Research Officer at the European Cancer Patient Coalition. He graduated from the Inholland University of Applied Sciences with a Bachelor of Science in Medical Imaging and Radiation Therapy. This was followed by a Master of Science in Governance and Leadership in European Public Health at Maastricht University, and an internship at the European Health Forum Gastein in Austria. During his studies he has supported people with cancer across the fields of radiotherapy, radiology, and nuclear medicine. He is directly responsible for activities in the Innovative Partnership for Action Against Cancer (iPAAC), 5 Horizon 2020 projects, and collaborations with the European Medicines Agency and BBMRI-ERIC. Max is fluent in English and Dutch and has a basic understanding of German. Kallirroi Pavlakou is a Policy and Communications Assistant at the European Cancer Patient Coalition. She graduated from the National and Kapodistrian University of Athens with a Bachelor of Arts in Political Sciences. This was followed by a Master of Arts in International and European Union Studies at Leiden University. Following her studies and prior to ECPC she has worked in NGOs in Athens, Greece and in Brussels, Belgium building up her experience in the field of policy and communications. Kallirroi is fluent in English and Greek and has a good knowledge of German. Paulína Gono is a Partnerships and Communications Assistant at the European Cancer Patient Coalition. She graduated from the Comenius University in Bratislava where she studied journalism. During her studies she experienced an Erasmus mobility at Sapienza University in Rome. Before she joined ECPC she worked in media and in NGOs in Belgium focusing on communication and event management. She gained the first experience in health sector on the European level through an organization EUFAMI focusing on families affected by mental ill health. She was involved in fundraising, campaigning and event organization of an art exhibition dedicated to raise an awareness about mental illnesses. Paulina is fluent in English and Slovak and has a good knowledge of French. Rafal Swierzewski has been involved in patient advocacy for ten years as both a scientist and cancer survivor. He earned his PhD in 2006 by examining the physical and chemical properties of new chemotherapy compounds. He served on ECPC's Board from 2013 to 2016. He currently represents the ECPC in the European Medicines Agency (EMA) together with the Vice-President of the ECPC. Through the European Medicines Agency, he has been involved in various projects, such as Adaptive Pathways, ADVANCE and WEBRADR. Rafal also represents patients' interests in the European Union’s clinical trial portal and database of stakeholder groups created within the European Medicines Agency to construct new systems for implementing European regulations on clinical trials and clinical data. Rafal speaks Polish and English. Alberto is a Policy and Communications Assistant. He graduated from the University of Zaragoza (Spain) with a Bachelor of Laws after which he pursued a Master in European Law at the European Law School (Maastricht University). Alberto is fluent in Spanish, English and French, and has a good knowledge of Italian.